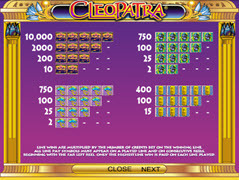 Cleopatra Pokie Review - Play today! Taking a trip down the grand Nile river, all the while being taunted by Cleopatra’s sultry voice, will grant you access into this amazing game that offers a 5 reel pokie and 20 pay-lines and is powered by IGT. You will be taken on an adventure too far off ancient Egypt with its mysteries and history. Here is where it gets exciting and opens the door to a free spin bonus, the really cool wild multiplier as well as scatter symbols. There has been a lot of interest worldwide in this specific game as it boasts a very achievable jackpot. 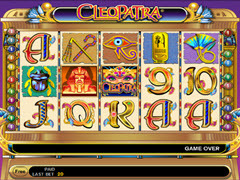 The Cleopatra game has some really cool graphics, boasting bold gold symbols with a kaleidoscope of colours. It is very easy to navigate around this game with the old familiar players leading the way. If the wonder and excitement of this mysterious city enchants you, this would be the game for you. The all seeing eye of Horus watches each move while the scarab scuttles across the reels mischievously. The Gold pendant when played right will grant you access to handsome prizes and the psychedelic lotus carving stands bright along side the crook and flail leading the way. This game also features poker favorites in a very bold and dashing manner. The wilds are depicted by the green eyes of Cleopatra, her symbols will come to view on on the reels to complete combinations. The wilds have the ability to change themselves into any other symbol appearing on the same line, the scatters cannot be substituted for by the wilds. The sphinx statue are displayed on the scatter symbols in the same, these come with massive rewards when at least 2 of them are shown in any order, the maximum reward is 100x the total bet amount when 5 of the sphinx are displayed. The free spins bonus will be triggered when 3 or more of the sphinx scatters fall on the reels. Here you will receive 15 free spins with each activation on the feature. In this feature you will be able to win up to 180 free spins by reactivating the feature i n which all your winnings will be multiplied by 3. Playing the Cleopatra game is very easy and like any IGT game will afford you wonderful opportunities to get to the whopping jackpot. All the other features like the scatters and wild multipliers can only enhance the appeal of this game. Secrets and mystery are key in this pokie and can’t but help leaving you with a memorable gaming experience.